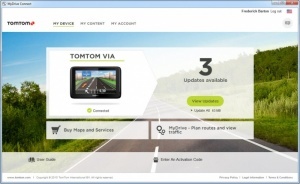 TomTom MyDrive Connect is the primary means of updating TomTom GPS devices. You can also use it to install and manage purchased maps and more. The software gives you access to various services, which can make your driving experience more convenient. It comes with a user friendly interface and intuitive controls, so anyone can use it without any effort. The software is offered completely free of charge and it works on all modern Windows systems. It can be installed in under a minute, without making any complicated settings. The program doesn't require any special drivers, but you will need a constant Internet connection and a TomTom online account. Linking your GPS device with your TomTom online account is the first thing you have to do. You only need to connect the device to your computer, with a USB cable, while the software is running. TomTom MyDrive Connect will detect your device and it will link it to your account automatically. Once a device is linked to your account, the software will let you know if any updates are available and it will also show a series of options, for buying new maps and other services and for planning routes and viewing the current traffic conditions. Updates come in various forms and sizes, from basic firmware updates to map updates. You can view detailed information about each update and decide which ones to apply or not. If you have purchased multiple maps and you can't fit all of them on your device, you can use the software's management capabilities to remove existing maps and add new ones. There is no need to be concerned if you remove a map, because everything is linked to your personal account and you will be able to add your maps back if you need to. TomTom MyDrive Connect provides you with all the controls you will ever need for a TomTom GPS device. You can update your GPS device with a single click. Additionally, TomTom MyDrive Connect lets you manage purchased maps. The software is lightweight and easy to use. You can download TomTom MyDrive Connect free here.